These sites list known vulnerabilities — at least the formally classified ones. You see that many other vulnerabilities are more generic in nature and can’t easily be classified. If you can’t find a vulnerability documented on one of these sites, search the vendor’s site. This site contains the SANS Top 20 Vulnerabilities consensus list, which is compiled and updated by the SANS organization. Manual assessment: You can assess the potential vulnerabilities by connecting to the ports that are exposing the service or application and poking around in these ports. You should manually assess certain systems (such as web applications). The vulnerability reports in the preceding databases often disclose how to do this — at least generally. If you have a lot of free time, performing these tests manually might work for you. Automated assessment: Manual assessments are a great way to learn, but people usually don’t have the time for most manual steps. Many great vulnerability assessment tools test for flaws on specific platforms (such as Windows and UNIX) and types of networks (either wired or wireless). They test for specific system vulnerabilities and some focus specifically on the SANS Top 20 list and the Open Web Application Security Project. Versions of these tools can map the business logic within a web application; others can help software developers test for code flaws. The drawback to these tools is that they find only individual vulnerabilities; they often don’t correlate vulnerabilities across an entire network. However, the advent of security information and event management (SIEM) and vulnerability management systems is allowing these tools to correlate these vulnerabilities. 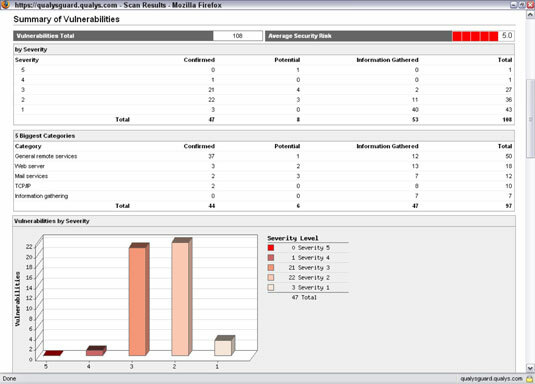 A favorite ethical hacking tools is a vulnerability scanner called QualysGuard by Qualys. It’s both a port scanner and vulnerability assessment tool, and it offers a great deal of help for vulnerability management. An executive report containing general information from the results of the scan. A technical report of detailed explanations of the vulnerabilities and specific countermeasures. As with most good security tools, you pay for QualysGuard. It isn’t the least expensive tool, but you get what you pay for, especially when it comes to others taking you seriously if PCI DSS compliance is required of your business. With QualysGuard, you buy a block of scans based on the number of scans you run. An alternative to QualysGuard that many people swear by is Rapid7’s Nexpose, which happens to have a free version (Community Edition) for scanning up to 32 hosts. Assessing vulnerabilities with a tool like QualysGuard requires follow-up expertise. You can’t rely on the scan results alone. You must validate the vulnerabilities it reports. Study the reports to base your recommendations on the context and criticality of the tested systems.